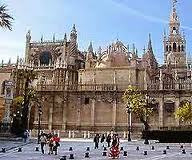 Seville is the capital of Spain’s most southern region, Andalusia. A city of exquisite architecture, its three greatest monuments include the Giralda Tower, originally an Arab minaret, the Cathedral which is the largest gothic temple in the world, and the Alcazar now the royal palace and official residence of the current royal family. It is a city that appeals to all ages and considered to have the best tapas bars and fantastic nightlife. However, because of its reputation of being intensely hot during the summer months (hence its nickname the frying pan of Europe) spring is one of the more popular times to visit. With two of Seville’s greatest festivals at Easter, the Semana Santa and Feria de Abril, the city is filled with colour and vivacity giving you a real flavour of its character and zest for life. A good place to begin exploring is in the oldest part of the city, which is the medieval Jewish quarter, Barrio Santa Cruz. Its narrow cobbled streets, and squares filled with orange trees, is almost like walking through a maze. Next to the quarter, is the Alcazar, originally the site of a Moorish fort rebuilt in 1360 by King Pedro the Cruel of Castile, and now the royal palace. 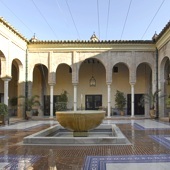 Many visitors come to see this fine example of Mudejar architecture, and enjoy strolling through the tranquil atmosphere of the gardens filled with water features and sweet scented flowers. The third largest Cathedral, after Saint Peters in the Vatican and London’s Saint Pauls, Seville’s Cathedral is also the largest gothic temple in the world. It is situated on the site of the great mosque, built in the late 12th century, and is so vast even the side chapels are large enough to be a church in itself. Inside the Cathedral is the tomb of Christopher Columbus, the famous explorer who voyaged across the Atlantic Ocean to the New World. Parts of the great mosque were used to build the 97 metre high Giralda Tower, originally a minaret later converted to a bell tower. The upper levels of the tower are reached by a series of internal ramps, which apparently the Arabs used to ride to the top on horseback. King Pedro apparently had quite an eye for the ladies, and with his wealth and status he had very little difficulty in getting what he wanted. During his frequent absences, he used to put his wife in the care of the nuns at Palencia. Struck by the beauty of its founder, Dona Maria Coronel, a Sevillian noblewoman, he pursued her relentlessly. However, living up to his reputation as being ruthlessly cruel, he even went so far as to have her husband executed. In order to make herself unattractive to him, it is said she poured boiling oil over her face. The remains of this extraordinary woman rest in the Convent of Santa Ines in Seville. 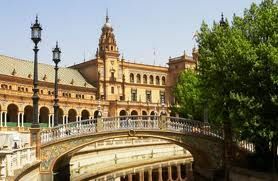 Granada and Cordoba are all within close proximity to Seville, therefore providing a number of day trip options. There is also the city of Jerez which offers an entertaining day out. Renowned for producing fine sherry and brandy, and claiming to be the home of Flamenco, its tours provide great entertainment. For horse lovers it is also where the fourth World Equestrian Games took place in 2002, and home to the Royal Andalusian School of Equestrian Art. Just like the Lipizzaner Stallions at the Spanish Riding School in Vienna, you will be able to watch the Andalusian horses give a charming performance of dressage to music. Seville’s passion for life has been the inspiration to several songwriters, painters and poets in the past. Many events and exhibits are held throughout the city, with collections by local artists on display at private studios. As a cultural and architecturally beautiful city and with a nightlife that will lift your spirits, it is no wonder that it is considered one of Spain’s finest.